I am happy to introduce the ZENGYRO Energy Band to South East Missouri. I ran across the product at a conference in Ohio. Let me tell you how it came about. I had gotten in late the night before the conference and found out I had reserved a flea-bag hotel online. It had a non-smoking sign out in front, but the room had an ash tray in it with a note that instructed one to smoke by the air conditioner or the exhaust fan in the bathroom. The odor in the room was disgusting and needless to say I didn’t get much sleep that night. The next morning I hit a huge traffic jam and was more than an hour late for the conference and already worn out. By the afternoon, I was nodding off and my neck was tightening up. I was going to look for someone to adjust my neck on the next break but I ended up first checking out the ZENGYRO Energy Band. This looked like something hokey but the booth was run by a well respected Doctor. So, I decided to look into it. I was introduced to the balance test. While extending my arms out I was instructed to resist the Doctor’s attempt to push my arms down. No Problem! Then he asked me to stand on one leg. I resisted. My footing isn’t what it used to be. I tried and was wobbly. Again, I was instructed to extend my arms out and now he pushed down on just one arm. I resisted, but to no surprise, with little or no effort I was knocked off balance. OK big deal, I could have told you that would happen. He then took out a ZENGYRO Energy Band and simply let it touch me by sitting it on my head. He asked me to stand on one leg and extend my arms. Here we go again! He then pushed on only one of my arms to throw me off balance and to my amazement I didn’t lose my balance. I stood there rock solid resisting his best attempt to throw me off balance. He pushed harder. No problem, I was still standing on my one foot rock solid. What the hell I thought? He explained that the band contains three holograms created by advanced laser technology. The ZENGYRO research team spent eight years figuring out how to design the hologram to capture specific frequencies of vibration. Each hologram radiates a natural frequency that resonates with the human body. In engineering and physics we were taught that everything vibrates at a natural frequency. Plus if you put two items next to each other that vibrate at the same natural frequency and start vibrating one of the items, the other item will start vibrating on its own. It’s called resonance. 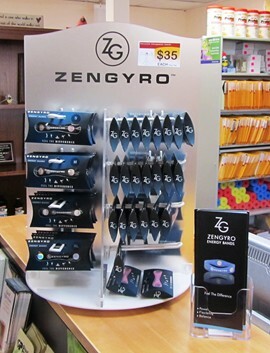 The ZENGYRO Energy Band is designed to resonate with the human body! Therefore, when your environment is trying to pull your body’s vibrational state away from its natural frequency, the ZENGYRO Energy Band makes it easier for your body to maintain its natural frequency. As a result your body has to exert less energy to maintain its normal state and has more energy to do whatever else it needs to do to maintain your health and homeostasis. So I bought one of the bands and I didn’t have time to get my neck adjusted on that break. I went back into the darkened conference room for another presentation. I was sure I was going to soon start nodding off again and regret missing that neck adjustment. Much to my surprise my neck slowly but surely started to loosen up. I also started to perk up some. It was a small change but over the years I’ve gotten pretty well in touch with my body’s function so it was easy for me to feel a difference. These improvements continued to accumulate throughout the afternoon. I never sought out anyone to adjust my neck. It took care of itself, plus I followed the remainder of the presentations of the conference with little effort. That evening I found a decent hotel and made plans to meet an old boss and his wife from my engineering drafting days. They wanted to eat Italian. I was reluctant since pasta and bread don’t usually agree with me. I gave in. What the hell, I thought, I hadn’t seen the guy in about 15 years. My appetite was good and I wolfed down a pretty good sized plate of spaghetti and garlic bread. We had a great evening. When I got back to the hotel I thought I was in for it, another sleepless night as my digestive system would try to deal with the insult to my system. I never took the ZENGYRO band off and went to bed with it. Much to my surprise, I was sound asleep at a reasonable time and slept straight through the night. Not once did an upset stomach wake me up and I got restorative sleep, which often eludes me. I was pretty refreshed upon awakening and managed to arrive early at the conference. I was sold. That day I ordered some of the bands to share with the patients in my clinic. They’ve since sold pretty fast. Not everyone realizes results as impressive as I did. Some are just not that in tune with their own bodies to notice much difference. The type A personalities who supresse their pain and are always pushing themselves often don’t notice much change, even though it’s still there. In general, it seems that the weaker one’s system seems to be the more one seems to notice differences. Our office manager noticed that her fibromyalgia pains and tightness in the shoulders eases up with the ZENGYRO. Others have reported improved energy, balance, less aches and pains, improved recovery from workouts, and better sports performance. 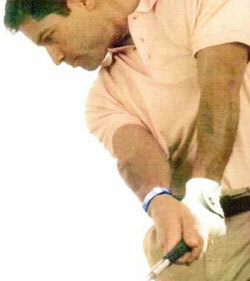 They are a hit with golfers! Professional LPGA golfer Michelle Wie says, “I started wearing the Zengyro last summer and I loved it. I won the Canadian Womens’ Open the next week and I haven’t taken it off since”. Go to Michelle’s web site at www.michellewie.com/photos and look at the photos in her gallery and you will see she does indeed wear the band. What will it do for you? It can’t be predicted, all you can do is try it. In general it will improve your well being and most likely your balance. Stop in or call and schedule a time when I can do the balance test on you so you can experience what I did first hand. Patients have brought it to my attention that there are other energy bands out on the market. I’ve tested several of them but they do not perform like the Zengyro. If you have one, bring it in and we will test it and see how it performs. 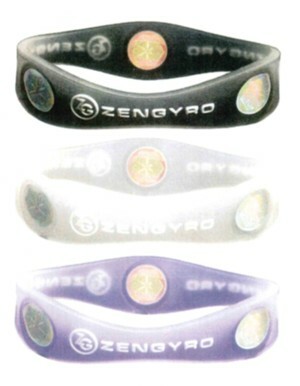 The Zengyro Energy Bands come in four different colors, Black, Clear, Pink, and Blue. There are four sizes to select from so it will accommodate any size wrist. Once you put it on you don’t have to take it off. You can wear it in the shower and sleep with it on. Factory workers who cannot wear any jewelry simply put it in their pocket while at work. It doesn’t have to touch your skin to work, it simply needs to be within one to three inches of your body. Some women wear the band on their ankle. The hologram will work indefinitely. The bands are manufactured with FDA-grade surgical silicon for comfort and durability. However, it’s not designed to go through the washing machine nor dryer. If the bracelet has any defects we can replace it if returned within 30 days of the sale. The ZENGYRO retails in our office for $35 plus $2.79 MO state tax for a total of $37.79. Shipping and Handling of $4 will be added to mail you a band. They come in three sizes. Stop by to fit for your size or estimate your size by measuring the circumference of your wrist and use the following recommendations: Small – 6.5″, Medium – 7.0″, Large – 7.5″, XL – 8.25″, XXL – 8.75″. Don’t go smaller than the size recommended for your wrist circumference.